Full JetBlue Mint Review: Does This Premium Product Live up to the Hype? Full Silk Air flight review of Business Class on a B737-800 from Singapore Changi Airport to Kathmandu, Nepal. A full Japan Airlines first class review for the B777-300ER including the seat, the meal and a shocking but pleasant surprise that happened during turndown. With an ever expanding presence, you may soon find Spirit Airlines as the best option for a future trip. It happens to me often now and the low cost carrier is quickly growing on me with its friendly flight attendants and overall value proposition. My experience recently flying JetBlue for the first time, why Long Beach is an amazing alternative to LAX and how long it takes TrueBlue points to post. Last weekend I had a number of things go sideways when flying American Airlines. What happened, how I dealt with it and how I got compensated for a delay. 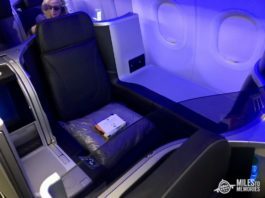 A full review of my son's first premium cabin international experience on United's BusinessFirst from Chicago O'Hare to London Heathrow.